Surprise was a constant theme this season at Plattekill. At this point, I can’t remember much before the beginning of March, but since that time I can recount several unexpected and pleasant events. First of course was Riley. Sure snowfall was predicted — anywhere from zero to 40 inches — but I’ll rely on the little known 40-Inch Rule, to postulate that any such storm is automatically awarded surprise status. On the last day of March — a beautiful sunny day — the Cats served up some great corn, a rarity this spring. Then, last weekend, in the complete surprise category, was the 15-inch Saturday night POW event, featuring first tracks on Sunday that some called the best of the season. This past week I watched NYSB’s Albany Weather page closely, looking for any soft snow, corn or pow, within striking distance. On Tuesday the Catskills showed up as a contender with a forecast for Saturday of 60 degrees and sunny skies. At the same time the rest of the northeast was looking at colder temps and mixed precip. But as the week went on, the forecast for The Wonderfuls also got cloudier and colder. Friday night, I set the alarm and checked the forecast one last time right before crashing: mostly cloudy, with temps in the 40s and a chance of showers. When I woke it certainly felt cloudy, with only a single star in the sky. The day dawned about an hour and a half after I left home; I was on the Thruway driving through the lower Hudson Valley. I could see that far to the north, there were clouds, but to my surprise, the skies above me were clear. As I got onto Route 28 my cell rang. It was Brownski, he was on his way to Roxbury too, coming up Route 17. “Hey man what is going on?” Neither of us really wanted to say what we were thinking, hoping to ward off any potential jinx. The way it worked out, all our dreams came true. 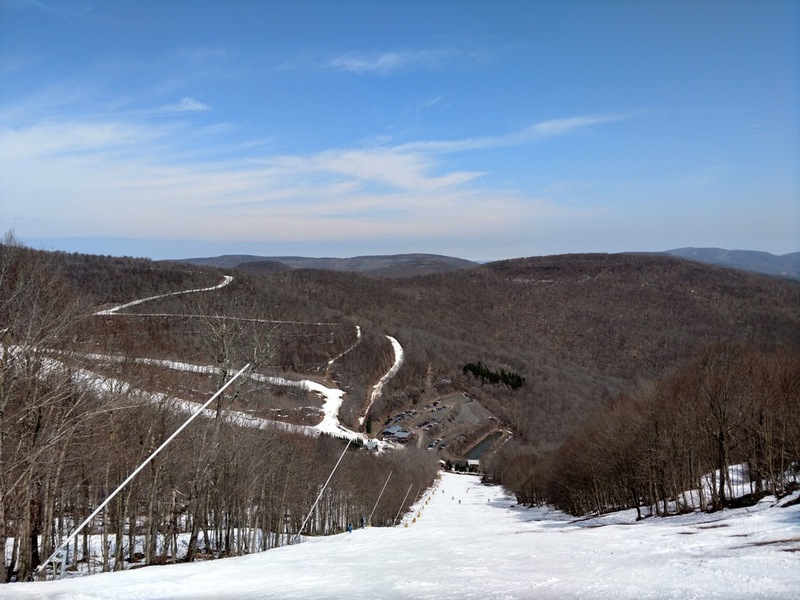 What started as a hazy sunshine at first chair soon burned off to a fully saturated Plattekill Blue Sky. 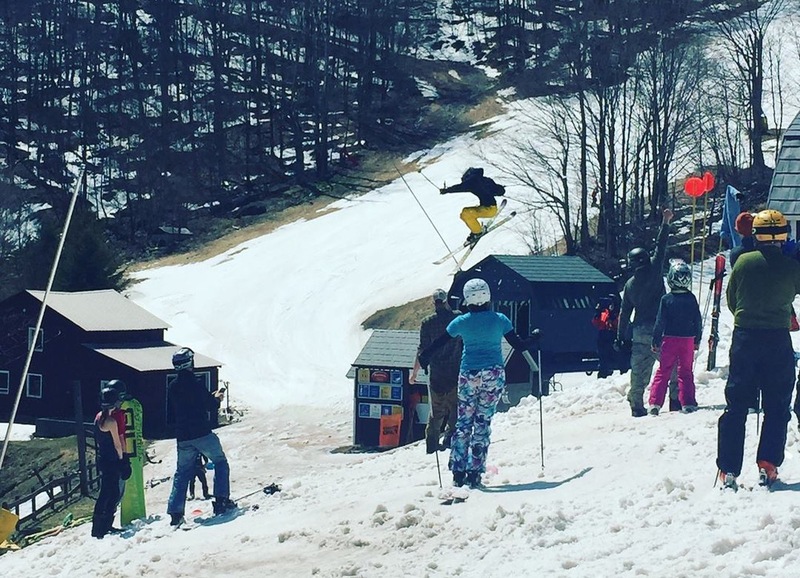 Springtime kismet is made with sunshine and corn, on a day when Plattekill is spinning her lifts. The skiing was fantastic and I practically ripped. It was warm, and liberating to ski in a teeshirt without gloves. There was a festive atmosphere with beers and burgers on the deck, and Matthew’s sweet kicker, strategically placed in front of the spectators. A nearly complete cast of AllStars were in attendance. But then, this is not all that unusual. 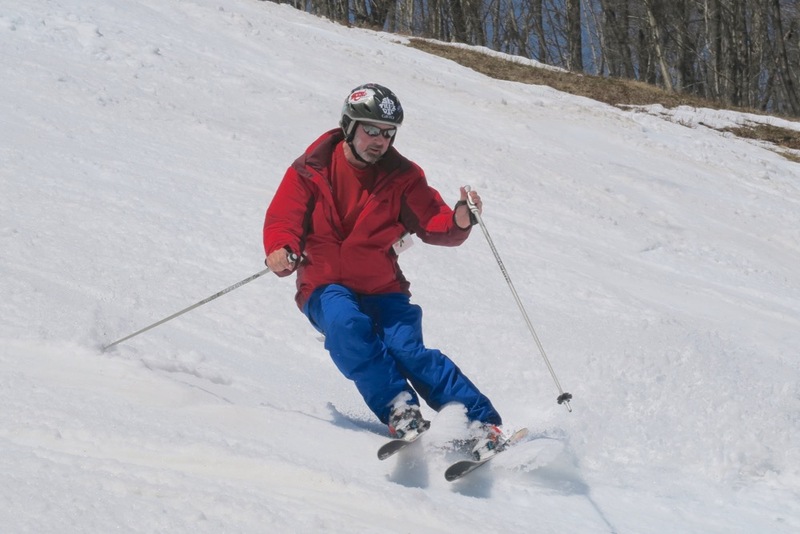 Plattekill skiers come the mountain expecting to be surprised on a regular basis. How is that even possible? At this time of year, warm weekend sunshine is a cherished treasure, helping to assure that the end of the season will be glorious. For me, it was easier to find powder in March than corn in April. Whatever, I’ll take it. Even with all the ups and downs, it’s been a great year if you’ve been open to surprises. Agreed, awesome season, I enjoy reading your coverage Harvey. To me this place is magical. Saturday 4/7/18 won’t ever forget. Funny, you had Spring there and we had full on winter in VT. Could not be any different weather.. What a way to close out Plattekill! I agree it was an unforgettable day- weather and conditions- the great mix of NYSB’rs and legendary Platty locals.- everything was just perfect. Hopefully I get more skiing in this spring but if that was the last day, at least it was a great one. The best four days of skiing that I have had over the last ten years have been the last two weekends at Platty! Saturday was a super last day of the year, just doesn’t get any better! Thanx Laszlo and Danielle for all your work in keeping Plattekill the best area in the Catskills, BY FAR! Thanks again for your good writing, friendship, and comradery in the woods this year! It’s been a blast! Great post. Warm sunny days are bittersweet, because we know the end is coming. Get it while you can! i’m never surprised by a great day at plattekill! Did Laszlo up the number of front page posts required to get Harvey his free season pass? With a knack for uncovering conspiracies, maybe you should consider a career in law. To date this season I’ve had 8 days at Plattekill. My top number before this year was five and my average is 3 or 4. All of my days there this season were excellent, and some were all time. My posts this year included my birthday, a 4-inch surprise day, Riley, and the amazing day above. For me, on each of those days, Plattekill was the place to be. This season from Nov 1 through today, we published 40 times. Plattekill was 25% of my season and 10% of the front page. Hey it is my blog. 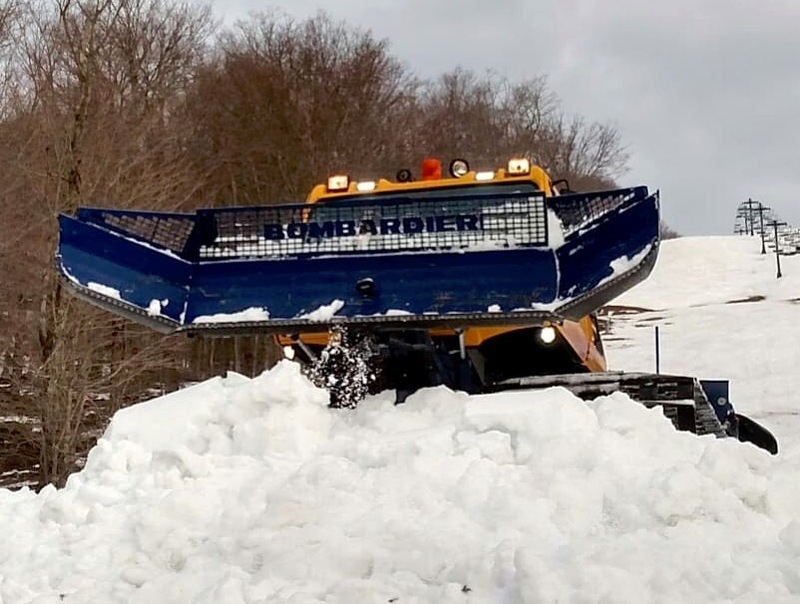 As far as the big influence scandal, here’s everything I’ve ever written on nyskiblog: http://nyskiblog.com/author/harvey44/ — If you look through all those posts, you’d be hard pressed to find much criticism of any ski mountain. I look for the positive when I am skiing and for me it’s about the conditions and the people. I scored in March because the conditions were good at ski areas where I can find great ski partners. And yea, some GMs encourage me to ski their hills. Whatever. Are you challenging me to be a legitimate journalist? Sorry bud, but I want to ski and have fun. And I don’t really care who approves. yes, glorious last day at platts after an especially great season there. superbowl sunday: forecast of 4″ delivers 9″ of pow that bonded to an transformed the hard surfaces to HERO by the first inch. free refills all day. 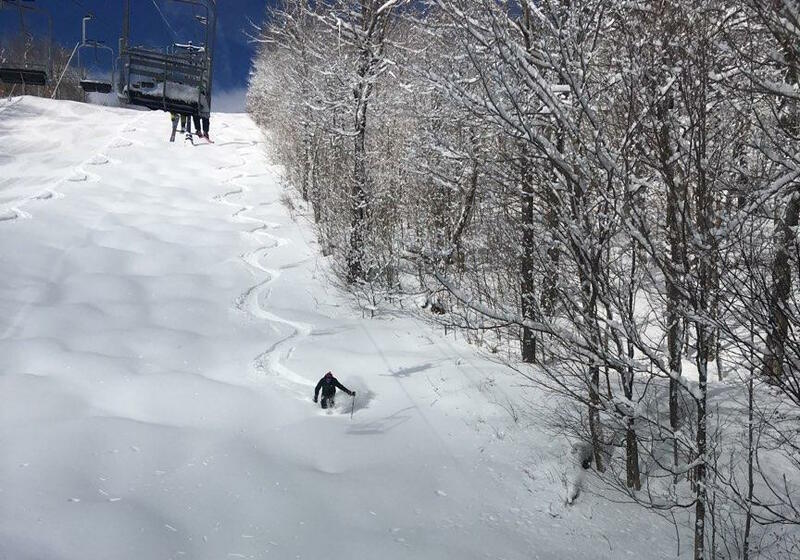 march 2. after the webcam had me bummed on march 1, comes one of the best ski days i’ve ever enjoyed. horizontal blizzard conditions from bell to bell and beyond. april 7. 2-3″ updated to 10-15″ as i approached roxbury. glorious fresh tracks and blue skies to boot. in between, beautiful sunny days, the best vibe in the east and rare spring ’18 corn. thanks to everybody at platts – and to the snow gods – for rewarding me every time i came out. Such a great day Harv! Very well might be the last day of the season for me and, if so, it was a hell of a high note to go out on. And thanks for supplying my new FB profile pic! Harvey, I ran some more numbers. Plattekill is 25% of your skiing and 44% of your front page posts. I don’t count the ones from the other writers. You wrote about 50% of your Plattekill days and only 21% of your other days. Regardless of why Laszlo gives you a pass, the fact remains that you get one. 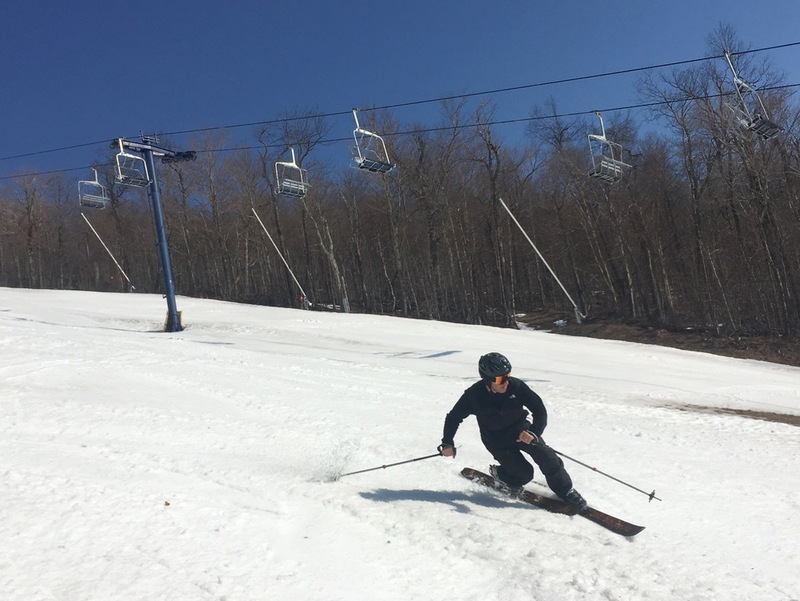 When you write about Plattekill more than any of your other ski days by a factor of two, I reserve the right to ask whether you’re skiing and writing about the positive as you are stating, or giving preferential treatment to the mountains that give you stuff. We too always look for the positive side to wherever we ski. We all have flaws, our technique, personality, what we wore that day, its like a ski mountain. FYI, Alicia, the kids and I are not sponsored, we rarely get anything for free, Harv got us a few tickets once. We pay our way and make our videos — which as you know, we do for the love of the sport. Don’t get us wrong, we love to be sponsored. Even with this, we try to always find what is great about the places we ski.. Looking forward to getting to Plattekill next year to shoot another story. Harvey, thank you for all your great posts, but especially your Platty reportage. Hats off to Lazslo and Danielle for keeping it real. Looking forward to making turns with you next season! 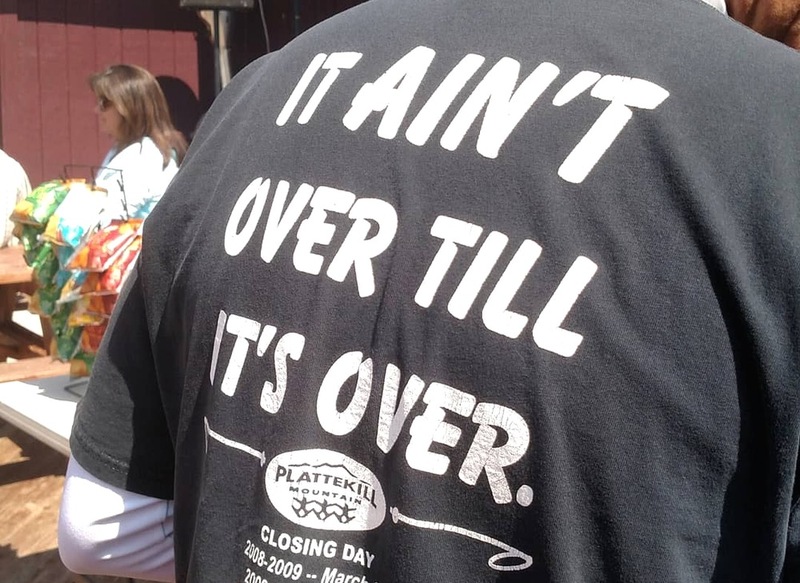 Harv, love reading your posts about Plattekill. The vibe there is amazing! Just wish I lived closer so I could get more than 1 or 2 days per season. Albas, one thing I do know about you guys, sponsored or no, your stories are what they are. In that respect we are doing the same thing, telling stories we want to tell, stories that make us feel good. Harv keep keeping it real. So happy you had a great day at Plattekill last weekend in the sun, (there was no sun here) it looks so fun in the pictures. I hope Gore delivers this weekend, looking forward to seeing you. Sno, I ran some numbers 99% of your posts are negative. I’ve done actual journalism elsewhere. On my own blog, many of my ski related posts are about Prospect or Mt van Hoevenberg. I.e. the same couple of places. I’ve gone to places where they lied about conditions (easier to do before the internet became ubiquitous) or had crap grooming. No one wants to hear about it. Skiing is about freedom and joy. Looking to get one or 2 more days at Prospect.